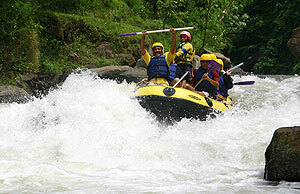 Probolinggo has other special interest tour called as rafting arenas. Tourists can easily enjoy the rush of exciting venues Pekalen River with only a distance of 26 kilometers by car from Probolinggo, or during the 30 minutes towards the South. Pekalen River is located in Angin-Angin sub-village, Ranu Gedang Village and ends at Gembleng sub-village, Pesawahan village or Condong village, Gending district. The journey to reach this river approximately 3 hours if we are come from Surabaya or Malang city. Pekalen River which becomes the arena of this thrilling sport, located at 500 m above sea level. It has varies difficulty level from grade I to grade III plus as many as 30 rapids rafting. Rafting may only be followed aged 10-60 years visitors. As far as 9 kilometers distance rafting applied for 2.5 to 3 hours, including breaks in the middle of travel while enjoying the fruits of young coconut (degan). Rafting Pekalen divided into three sections for rafting: top Pekalen, middle Pekalen and bottom Pekalen. The distance from the rafting trip is also different. Top Pekalen is 12 km trip, middle Pekalen is 7 km and bottom Pekalen is 10 km. Beside enjoy the Rafting exclaimed, we can also see the cave with hundreds of bats occasional screech and flying around. The rancidity and the dropping of the bats are exquisite when passing there. There are several rafting guide in Probolinggo which are ready to provide a variety of attractive packages with a variety of challenging rafting attraction. The rafting guides are Noars, Regulo and Songa Rafting. Those rafting guides have been fitted with safe rafting equipment. The visitors are guaranteed to feel satisfied and enjoy all facilities provided.